Whilst we all know that both seek fame and popularity enough to have their contents devoured, the way they do it is what we are going to access. 1. Both requires talent and hard work. Is there a blogger that is famous and doesn't work hard? Have you ever seen successful musician who is so lazy? We all can agree here that talent and hard work are the required elements to achieve a level of success in blogging or music. Bloggers work hard developing contents for humans, music artists work hard recording musical contents for music lovers. Bloggers edit, rewrite, and proofread their contents before publishing. Likewise, musicians edit, fine tune, mix and master their works before releasing. Their goals is to satisfy their target audiences. 2. Blogging and music production are niche specific. 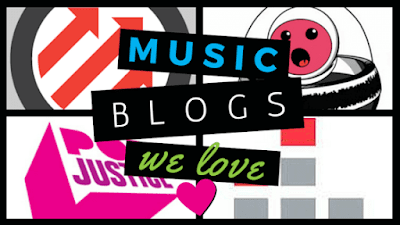 There are no generic blogging content, so as music. There is no song that appeals to the whole human race. In blogging, we have different niches like Business, Entrepreneurship, Health, Sports, News, Romance, Entertainment, and many more. In music, there are so many different categories like Hip Hop, R n B, Pop, Afropop, Gospel, Rock n Roll, etc. The audience for these categories are different. When blogging, experts always advice bloggers to be niche specific. They say "blog about the things you know very well". Also in music, there are only few music artists who can mix different genres. 3. The promotion of contents in both industries are similar. Music artists release their songs on various music websites and CDs. They go to radio and TV stations, meet DJs to solicit for massive air plays and so on. Bloggers also publish contents on their personal blogs or other platforms, also create Ebooks and Webinars. They send links of these contents to social networking sites and even advertise on different social media platforms. What is the essence of producing contents when no one listen to your music or read your blog posts? Branding, marketing and promotion are important to music and blogs. 4. Bloggers can also become "live public performers" like Musicians. Are you thinking about how this can be possible? When all is set and done, and a blogger/artiste become an authority in their target niche, they start to gain some level of recognition and respect. For the music industries, public/private shows and interviews will start to roll in. Also in blogging, top bloggers are invited in various conferences and outings, they are interviews, become public speakers and teachers. In fact, a top blogger is considered a celebrity just like top acts in music. Globally, look at bloggers like Neil Patel, John Morrow, Paris Hilton, and Glen Alsopp. In Africa, look at Linda Ikeji, Seun Osewa, Jide Ogunsanya, etc. These are top bloggers that can hold their own group alongside top musicians. 5. Reaching out to influencers and building back links. To become a force in the blogosphere, newbie bloggers reach out to top influencers in their niche for shoutout and juicy back links. In music, up and coming acts reach out to other top artists as well for collaboration. This is to reach the top artists' -who is already an influencer- fan base. The major key of collaboration, be it in blogging or music is to reach a ready made audience. In blogging, back links matters a lot. Back links tells search engines that your site can be trusted so that your blog can increase in search engine result page (SERP) ranking. All these are search engine optimization (SEO) strategy that I would talk about in subsequent posts. This process can also be likened to the music industry, where working with top artists can help the up and coming act build a nice portfolio that would tell music lovers that this person is serious and ready to deliver. 6. The use of keywords. Do you know artistes jump on wavy, viral, or trendy issues, dances, or slang to create new materials? For example, when the dance move, dab, was trending, a lot of musicians worldwide started singing to the tune of this dance move, with the mention of the actual word "dab or dabbing" in many of this music. This can also be called "keyword optimization" which many bloggers never take for granted in SEO for their blog. Bloggers carry out keyword researches to discover words/terms that are trending. Tools like Google Trends, Buzzsumo, Semrush, Google Keyword Planner, Uber Suggest, etc are use to generate keywords that would be integrated in blog post so it can jump on the current trend. 7. Bloggers look for avenues to earn money just like musicians. There are many ways a blogger can make money online. Most popular of these ways are selling Ads spaces or using Ads services like Google AdSense, Infolinks, Media.net etc. Other ways is to engage in Affiliate marketing, sell own products or offer expertise services. In the music industry, up and coming acts are also looking to grow so as to be able to offer themselves for ambassadorial roles for top brands where they get to help advertise the brands' merchandise or services. Musicians also sell their own works on various platforms like iTunes, Spotify, Google Play Music, etc. The key here is that both industries make money. 8. There are important things to be learnt when one is just starting out. Newbie bloggers have to learn a lot of strategies like writing for the web, keyword optimization, on-page and off-page SEO, use of Meta tags & description and Header tags, and so much more. In music, new acts are trained to become entrepreneurial by heart, they learn how to dress and conduct themselves in public, learn new sound engineering stuffs and so much more. All these is to enable the newbies become a better professional. 9. Persistence and hard work is highly required for both channels. As a newbie, if you don't blog persistently and put up a lot hard work, then quality results may be hard to achieve within a reasonable time. In music as well, if you take your legs off the pedal, you can be kicked downwards and below where it would be very hard to rise from again. Do not be one of these bloggers who don't publish more than once in 6 months. I don't there is any top musician that is famous for only releasing a new material once in a very long time. To become really recognized, a lot of work would have been done and a number of successes must have been achieved. For bloggers, writing top contents regularly and that are well linked together tells the search engine crawlers that this is a serious business. 10. The competition to get to the top is very high. In music, there are a lot of artistes all looking to become number one. And to get to the top, you need a lot of materials that would be generally accepted. Contents that go really viral. In blogging, you also need contents that has gone viral with many social shares and page views. Top bloggers have hundreds, some thousands, of exceptional contents that has gone viral. Many of these bloggers have blogs that ranks really well on Alexa ranking and MOZ ranking. Their domain authority (DA) and page authority (PA) are over average. These bloggers have been able to edge competition. So, as a newbie, to get to the top amidst the strong competition takes a lot of hard work and persistence. 11. Blogging or Music can be done part-time. There is this saying that don't put all your eggs in one basket. You don't have to quit your regular jobs to dive into doing music or blogging. In fact, if your starting a new blog or a career in music, you need some amount of money to get yourself rolling on the right track. So, if you don't have another job that can find your blogging or music career, then you may be in for a long thing. It is no secret that if you are not Neil Patel or Glen Allsopp, you can not start a blog and make money with it in 20 days. Just like in music, there is no way you can hit it real big like Rihanna or Chris Brown that had been in the game for quite a lot of time. As an up and coming act, you need to be able to fund your first studio sessions, first music release and so on. In blogging, you need to able to invest in a personal domain, hosting plans, professional logo, Ads, and pay for other services. If you think many of these things come cheap or free, then you may be deceiving yourself. Do not leave that other job until you are certain that your blog can make a regular income for you. In conclusion, perseverance, persistence, and hard work is required to grow in blogging and music. Newbie bloggers, like up and coming acts, have many things in common in terms of striving to get to the top. If you are a newbie blogger, and you really want to get to the top, then you need to come back often to this blog for more interesting blog posts like this where we travel on this journey together. Don't forget to share this content to your friends.